A combination of discussions in the All-Star run and ending of CBM threads led me to try this. Many cited the Synchronic collection article as one of their favorite in the Gary Carter days (it's in # 67 from March 1999). I couldn't agree more as it launched me on my Quest: collecting books on shelves around Four Color 386: Uncle Scrooge, namely March 1952. I gave myself 10 years (I started in July 2001) to finish the collection. As Steve F. would contend, this is not much of a quest as most books are to be found in dealers' inventory. Yet, since I am on a budget, it is still taking time to amass and some (though few) books are not showing up with any regularity. Due to these restraints, I decided that mid- to low-graders will do for my purpose. I plan on putting up a scan a day, in alphabetic order, of those I already have. This should illustrate the diversity of the market at that time period. Here's a snapshot of the task: I counted a total of 420 books fitting my eligibility criteria. I am in awe of some board members' collections and realize this might have limited interested for everyone. Yet, I have found this approach to collecting a wonderful way to discover some less visible aspects of this hobby. In the 229 issues I already have (and 12 more coming in the mail) I also have already identified 113 different artists. Please give me some feedback as to your interest in this. One of several tie in with radio programs, more common from DC than any other publishers. We will see this again with Henry Aldrich, Gangbusters and Mr. District Attorney. Thanks for the percentage breakdown. It certainly shows that the Atomic Age, like the Bronze age, was an age of diversity of genres and material. 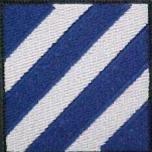 Why don't you change the name of the thread to the March 1952 thread? That way folks that have comics from that month can posts scans to a "virtual" collection. I'll look and see if I can't find something to contribute. Good luck with the quest. It's very cool to imagine all those books on a newstand -- and how tempting they would be to the kids back then. Please give me some feedback as to your interest in this. I think it is a heck of an idea to make this post! I'm certainly interested. Narrowing things down to a month/year certainly makes foir a fun quest! And give a beautiful cross-section of what was going on! Very cool! Why don't you post a list of the books you need - witness Ian, I'll bet lots of us here could help you out! I'd forgotten about that CBM article - neat idea. I wouldn't do it myself as it would involve buying too many books I don't find very interesting, but I love the concept. 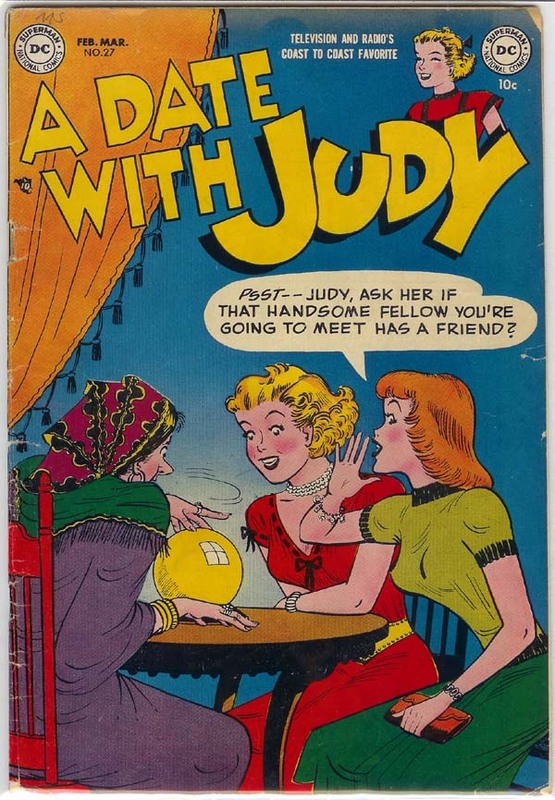 Interesting to see that a third of all comics published in that month were either Western or Romance, two genres of limited appeal to collectors today. Are you going to be buying any vintage spinner racks to display your collection? BTW, I've eaten tommyfoxwood's dust on an auction or two myself, so you have my sympathies. I've posted this before as far as displaying the collection but some of you might not have seen it. I looked into finding a spinning rack but didn't have much luck. I still keep an eye out for one though. Do you have a list of the individual books you still need? 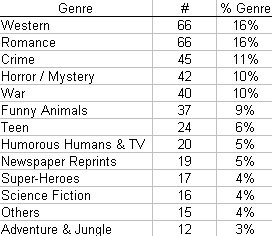 Since there is interest in Publisher and Genre breakdown (there is a similar table in the Gerber books), let me show you what 10 years do to these breakdowns. I have created similar tables for July 1942, March 1952, March 1962 and June 1972 (what one would do for his hobby!). Let me also start a trivia question: I have purchased 60 of the books for June 1972 (talk about buying stuff you don't want but they are super-cheap). By the time I am done, I will have to purchase 23, yes that's 23 titles that have been continuously published from March 1952 to June 1972. That's 20 years on the shelves. Some have had hiatus of less than a year. Which titles are they? I eliminated such titles that are similar but are not related: Combat Kelly, Fightin' Marines (St. John and Charlton), Love Diary (Our Publishing and Charlton), Marvel Tales, Young Love (Prize and DC). There could have been a 24th had Treasure Chest lasted a few more months. Let's start hearing from you, trivia masters. Now that is cool, something I love to have for my own home one day. Definitely agree this is a cool idea. 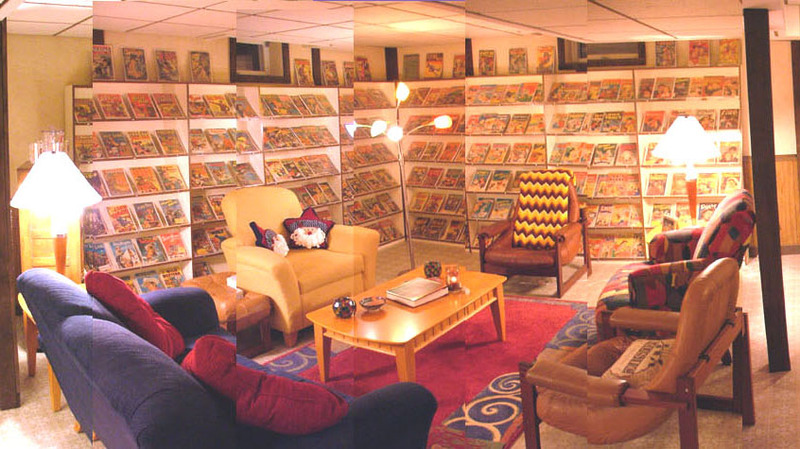 There have been some posts at various times by people of comics from their birth month, and I believe some people have tried to collect comics from that month, but I don't think anyone has gone quite to the same degree as you. Good luck on your quest, and as FD mentioned, post your want list, I bet these Boards can help you out on at least some of them. great idea! Thanks for posting the collection. Very nice display too. What is the most costly book of that month? Is it the US1? Close: highest is Fawcett Movie Comics # 15: The Man from Planet X at $ 654 in Fine and $ 2400 top guide. A coverless copy just sold tonight on eBay for $ 20. There is a reprint of it. I may just a copy of that for now. Followed by Weird Tales of the Future at $ 285 in Fine and $1,050 top guide. Then U$ 1 at $ 275 in Fine and $ 1,250 top guide. And yes, guide values here are obviously not reflective of Fair Market Value and all three go for less than guide always. 1) Hot Rods and Racing Cars - Charlton 1952 # 3 and 1972 # 108.